This caramel pear bake is a good choice for a novice baker or a cook in a hurry. 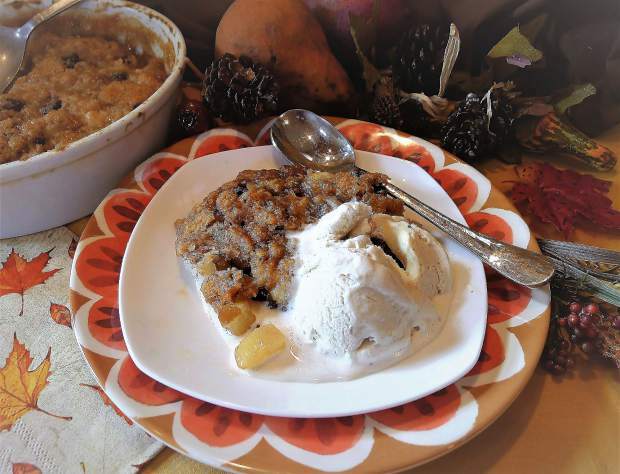 Here’s a fast, easy dessert that’ll warm you like a fire in the fireplace. Diced pear, chopped pecans, and dried cranberries are nestled in cake batter, then bathed in brown-sugar syrup and baked into a sweet, gooey cake with a caramel-like sauce. Serve it warm, with a scoop of vanilla ice cream. It’s old-fashioned, unpretentious and just plain good. A perfect ending to a casual meal on a cold day. It’s so simple to make that I hesitated to publish it, thinking readers would prefer more complex recipes. Those who tested it convinced me that simplicity is a good thing and urged me to share it. So, the truth is this dish asks very little of you; it’s in the oven in about 10-15 minutes and doesn’t even require your electric mixer, using only two bowls, a few measuring cups, and a whisk and spoon. It’s a good choice for a novice baker or a cook in a hurry. It’s important to select pears that will not disintegrate when baked. I recommend Bosc pears but if they’re unavailable, D’Anjou will work as well. Choose pears that are ripe but still firm, if they’re soft, they’ll be mushy when baked. Remove any bruises before cutting the pears into cubes. You can also substitute Golden Delicious apples for the pears if none are available. If you lack superfine granulated sugar, you can replace it with regular granulated sugar, it won’t dissolve as quickly as the finer-grained sweetener, but it’ll work. Use brown sugar that’s lump-free and dried cranberries that are soft and pliable. The dessert will bubble up as it bakes, so make sure your baking dish has sides that are at least 2 inches high. Make in a one-quart baking dish with 2-inch sides.Can be doubled. 1. Preheat the oven to 375 degrees with a rack in the center position. Line a cookie sheet with aluminum foil or parchment paper. Set it aside. 2. Place the flour, granulated sugar, baking powder, apple pie spice, and salt in a mixing bowl and whisk to combine them well. Add the milk and whisk again until smooth, making sure all the dry ingredients have liquefied (the mixture will be thick). Add the cubes of pear, the pecans, and, the dried cranberries. Use a wooden spoon or rubber/silicone spatula to gently stir them into the milk-flour mixture until they’re evenly distributed. Scrape this into your baking dish (no need to grease it), smooth it and distribute it evenly. Set aside. 3. Add the ¼ cup plus 3 tablespoons of water to a glass measuring cup or a microwave-safe bowl with a spout. Add the brown sugar and pieces of butter and microwave on high heat until the water boils, the sugar dissolves, and the butter melts. Alternately, bring a pan or kettle of water to boil on the stovetop. Measure out ¼ cup plus 3 tablespoons of the boiling water into a bowl, add the brown sugar and pieces of butter and stir until the sugar dissolves and butter melts. Pour this over the pear-pecan mixture in your baking pan, covering all of the pear mixture. 4. Place the baking pan on the prepared cookie sheet (the brown sugar syrup will bubble up as it bakes and, if it boils over, the lined cookie sheet will catch the drips). Put both in the oven and bake until a gooey cake forms, the top of the cake is set, and the liquid that surrounds the cake has thickened into a bubbling sweet syrup, about 35-40 minutes. The longer it bakes, the more the wonderful syrup will evaporate, so remove it from the oven as soon as it’s done. Cool it a little, and serve it while it’s still warm. Or, cool it completely, store it, covered, in the refrigerator, and rewarm it in a microwave oven or in a 350 degree standard oven. Serve it warm with vanilla ice cream. It’s best the day you make it but it’ll still good the following day, though the pears will have softened a bit.